Let's face it: In these modern times of technology overloads and a general sense of global fragility, the quest to quiet the mind and find new ways to achieve relaxation feels more important than ever. This quest has led us into a new era of wellness. One in which many people are exploring alternative healing practices that have actually been around for a very long time, in fact. One ancient modality that's experiencing a surge in popularity is the sound bath. The process of manipulating sound for healing can be traced all the way back to the Greek philosopher Pythagoras, who utilised sound as a form of medicine to treat a variety of ailments. Sound bath practitioners are not performers. Rather, they work to utilise various instruments as tools to facilitate a shift in the participant's consciousness. They strip away the structural elements of music like rhythm and arrangement. When properly executed, the result is a slowdown of your brainwaves, shifting from a more active state (beta) to a more relaxed dreamlike state (alpha). Unlike a traditional music concert, the experience does call on you to observe or pay attention. It’s a facilitation into a deeper state and an opportunity to unplug from reality to gain perspective with what's going on within you. 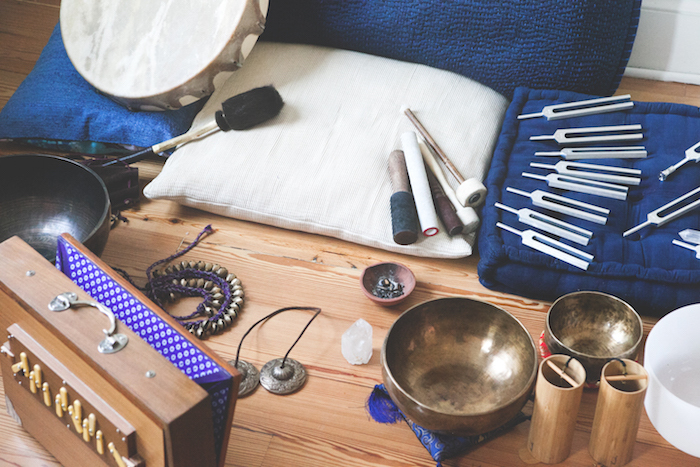 And if you enter a sound bath with the intent of analysing what instruments are creating the sounds, it could ultimately take longer for you to settle into that relaxed state. Your body, mind, and spirit hold the energetic imprints of all of oyur experiences, and sound vibrations have a way of shaking things up. Because of this, you can induce a sense of bliss one minute and a feeling of unease the next. This uneasiness occurs when the environment promotes a release, so if it happens to you, just breathe through it rather than letting yourself be submerged in it. Bring your attention to the rhythm of your breathing. Tune into your deep inhales and deep exhales. A good facilitator knows how to relinquish the notion of self in favour of serving the community in a selfless way. A well-studied facilitator knows how to create and hold a safe space while introducing the power of sound. What's so remarkable about sound baths is that even first-timers can accrue their benefits. After all, everyone has a relationship with sound. Noise is immediate and it has a way of having a direct impact on our whole being. Not to mention, sound baths don't require the discipline that meditation does. You don't have to be a well-practiced yogi or self-care practitioner in order to have a profound and positive experience with sound. In fact, a sound bath can serve as a gateway to these practices by introducing you to what it feels like when calmness enters the mind. PS: For some great tips on how to relieve stress before bed, read this.